ESPN Sport Science is an Emmy Award-winning TV series, hosted by John Brenkus, which uncovers sports' biggest myths and mysteries by using cutting-edge technology to measure momentum, friction and the laws of gravity. 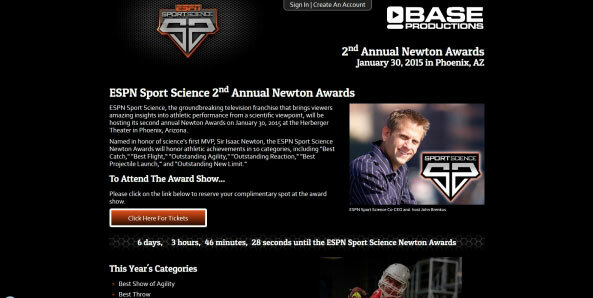 The 2nd Annual Newton Awards, named for Sir Isaac Newton, honored the best in athletic achievement as measured by unprecedented scientific analysis of thousands of moments, plays and performances from the world of sports during 2014. EZ Ticketing was approached by BASE Productions, the producer of the awards show, to meet their specific event requirements. The show was held on January 30, 2015 at the Herberger Theater in Phoenix, Arizona, and the audience contained both VIPs (including nominees, agents and sports celebrities) and sports fans. The challenge was to accommodate both groups in an orderly manner, and give BASE Productions the ability to assign seats easily as their VIP guest list filled out. To meet this requirement, we used a combination of our reserved seating system as well as our general admission system. A number of seats were blocked off for VIPs and the rest were available for sports fans to select their own. Sports fans were issued tickets with specific seats, VIPs were issued general admission tickets. We created a custom utility for BASE Productions to arrange the VIPs in the blocked off seats, which used a simple drag and drop feature to assign seats to the guests. On the afternoon of the taping, the VIPs were escorted to their assigned seats, then as the sports fans arrived they were able to go to the seats they had selected online. We were very honored to be a part of this production and are thrilled that EZ Ticketing was able to offer a flexible solution to such a unique requirement.